The formation and expansion of the U.S. Africa Command (USAFRICOM) signals the increasing strategic importance of Africa to U.S. security interests, especially in light of the 2014 U.S.-Africa Leaders Summit on strategic relations. 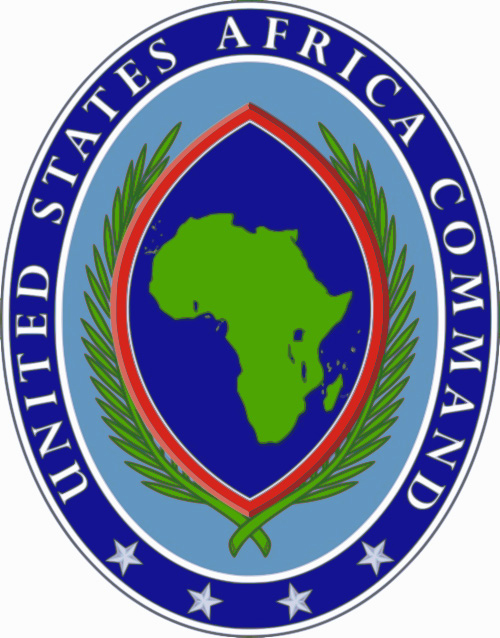 USAFRICOM is a U.S. geographic military command established in 2008 as a regional framework to address regional security issues in Africa, including contingency operations when necessary. This paper examines how U.S. policy toward Africa shapes the U.S. Africa Command (USAFRICOM) and how the regional command itself serves as a mechanism for policy implementation. Accordingly, I examine the U.S. policy of promoting regional security and stability in Africa and the role of AFRICOM in emplementing that policy as articulated in policy documents such as the U.S. National Security Strategy, the Quadrennial Defense Review, the U.S. Strategy toward SubSaharan Africa, and other strategic guidance. It has been suggested that USAFRICOM represents the militarization of U.S. foreign policy; however, this paper argues that USAFRICOM serves only as an implementing mechanism for U.S. policy toward Africa, including U.S. security cooperation with African states and regional organizations in order to build indigenous security capacity in dealing with complex regional security issues. A separate command for Africa also underscores U.S. commitment to the region, including developing contextualized approaches to regional security issues and thus strengthening U.S. policy credibility. Rather than marching to the beat of its own drum, USAFRICOM adheres to and informs strategic planning and strategy formulation of U.S. Africa policy originating with the U.S. national security planning process in Washington, DC. The paper concludes that USAFRICOM has been successful in implementing U.S. policy toward Africa, including its applicability in refining U.S. regional security strategy, addressing security issues and building African security capacity. The U.S. has a responsibility to defend its security interests globally and be ready respond to emerging crises anywhere in the world at a moment's notice. The global U.S. military command and control structure divides the world into various geographic regions for the employment of U.S. military forces in support of the U.S. national security strategy. It is an international reality that reflects U.S. regional policies, including U.S. policy toward Africa. The relatively new USAFRICOM is one of six U.S. Department of Defense geographic commands – the U.S. Africa Command (Africa), U.S. Central Command (the Middle East), U.S. European Command (Europe), U.S. Northern Command (Canada, Mexico and the U.S.), U.S. Pacific Command (the Asia-Pacific region) and U.S. Southern Command (Latin America and the Caribbean). USAFRICOM is a geographic command in a strategically important, rapidly changing and increasingly complicated region of the world that contains serious implications for U.S. security. This global structure underscores the stake the U.S. has in strengthening the international state system, including the ability to work on global and regional security issues as well as respond to emerging crises that may threaten U.S. and regional security. This structure not only enables U.S. crisis response options but also facilitates U.S military engagement ─"security cooperation"─with African states and regional organizations in order to improve regional security. Additionally, this structure enables regional familiarization, including U.S. access to forward operating locations in order to deal more effectively with security issues and emerging crisis in the affected regions. The formation and expansion of the U.S. Africa Command (USAFRICOM) signals the increasing strategic importance of africa to U.S. security interests. Basically, the U.S. seeks a stable Africa using USAFRICOM as a regional framework to enable U.S. crisis response and build African security capacity in order to strengthen regional security, which has positive implications for U.S. security. U.S. policy toward Africa consists of the following objectives gleaned from U.S. policy documents, speeches, and statements, and general scholarship on Africa: strengthening state sovereignty; countering terrorism in the post-9/11 world; stabilizing fragile states; building the security capacity of African states and regional organizations, especially for peacekeeping; and humanitarian and disaster relief. U.S. policy toward Africa reflects recent historical developments in the region: the evolving threat of terrorism, particularly alQaeda and its affiliates in Africa, the increasing international pressure on the United Nations (UN), U.S. and regional organizations to stabilize fragile states and respond to humanitarian crises, such as the drought and famine in the Horn of Africa, and the increasing reliance on international peacekeeping for conflict resolution in the post-Cold War period. Indeed, the Fund for Peace, a non-profit organization focusing on weak and failing states, warns in its 2014 Fragile States Index that approximately 30-40 African states remain at risk of becoming failed or failing states. This has implications for sustainable regional security and U.S. policy toward Africa.4 In response to these developments, the U.S. has been pursuing a regional security strategy largely based on crisis management, including U.S.-Africa security cooperation, where the U.S. can help Africa solve its own regional security problems by developing African security capacity. Generally, the U.S. is working together with the UN, African Union (AU), regional organizations and African states to improve their responsiveness to regional crises in order to shape the global and regional security environment. That is especially true for peacekeeping, where the U.S. is "loathe" to participate in African peacekeeping missions, partly due to the ambiguous nature of peacekeeping and the serious problems facing contemporary UN peacekeeping.5 Indigenous African crisis response and peacekeeping capabilities not only relieve pressure on the U.S. to intervene in regional crises, but also strengthen the credibility, reliability and legitimacy of peacekeeping operations. Regional organizations can also be particularly effective at mobilizing resources and facilitating cooperation between African countries in affected regions. Additionally, such organizations can provide the regional expertise necessary to increase the probability of success of peace interventions in Africa. Such peacekeeping operations in Africa strengthen implementation of the U.S.Africa security agenda by accelerating the development of African security capacity in response to regional crises. U.S.-Africa security cooperation establishes an interdependent relationship where Africa gains recognition and increases its own security capacity to address regional security issues, while the U.S. leverages Africa's security capacity for problems that may threaten U.S. security without getting involved in an endless series of conflicts and quagmires. Such interdependence is enhanced by collective security mechanisms, such as the UN, AU and regional organizations that enable regional cooperation on security issues, particularly peacekeeping, and humanitarian and disaster relief in Africa. The U.S. and Africa certainly share common strategic interests in advancing peace and security in the region. The 2014 U.S.-Africa Leaders Summit and prior U.S. presidential visits to Africa in 2013 and 2009 simultaneously underscore the convergence of U.S.-Africa security interests and signal increasing U.S. commitment to the region. The contemporary issues and themes discussed at the 2014 U.S.-Africa leaders summit in Washington, DC included regional security and stability. This new regional security initiative underscores the importance of U.S. support for peacekeeping in Africa, including establishing an African rapid response mechanism and developing robust African peacekeeping capability to cope more effectively with emerging regional crises. U.S.-Africa security cooperation has been a source of continuity in U.S. policy toward Africa. During his visit to Senegal, South Africa and Tanzania in 2013, President Barack Obama highlighted the importance of such cooperation on the basis of "a new model for U.S. engagement with Africa, supporting African-led solutions to security," which exemplifies U.S. policy toward Africa.16 Rather than acting unilaterally, the U.S. prefers to work collaboratively with the UN, AU, regional organizations and African states to build consensus and find mutually agreed solutions to regional security problems. 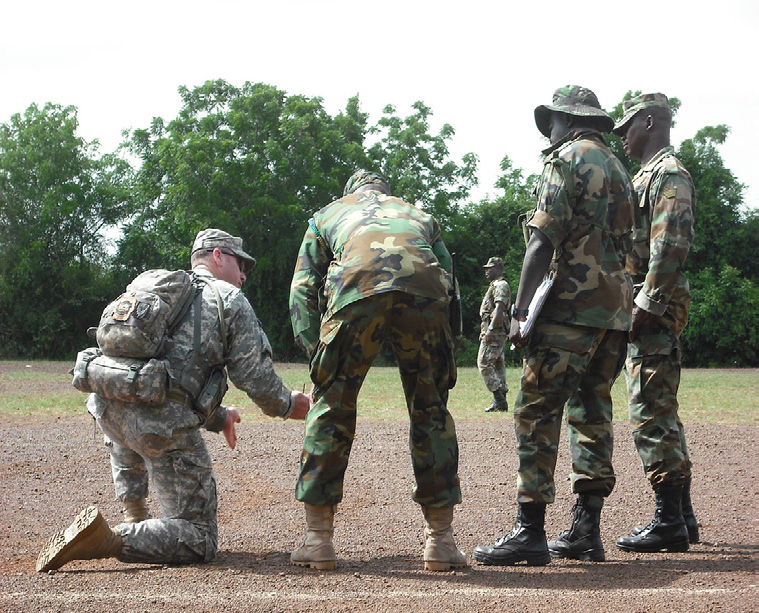 U.S. training program with Ghanaian troops. The U.S. has been criticized for the perceived militarization of U.S. Foreign policy toward Africa. Notwithstanding, there has been criticism of the perceived U.S. focus "almost narrowly, on the so-called war on terror. "19 Some also criticize the perceived militarization of U.S. foreign policy toward Africa. According to Emira Woods of the Institute for Policy Studies, "It is not only the continuation of the Africa Command started under George Bush, continued under President Obama, but we see, quite frankly, that─you know, the new announcement of a drone base in Niger. Although questions have been raised about U.S. intentions, President's Obama's message of Africa's increasing strategic importance to U.S security and the necessity for enhanced U.S.-Africa security cooperation to improve regional security reflect a core tenet of U.S. policy toward Africa. In order to be taken seriously, such policy depends on U.S. credibility regarding global and regional security issues. As the internationally-dominant state, the U.S. definitely has a stake in preserving and strengthening the international state system, including Africa, which acts as a restraint on the U.S. saying one thing and meaning another in terms of policy. According to Robert Jervis, "The desire to preserve the international system and the signals that lend it greater predictability will be more important when the actors value the system, prefer long-run over short-run gains, and have more common than conflicting interest. "23 With 54 countries, Africa wields considerable, even decisive, influence in international organizations. This is especially true within the UN system regarding global issues, such as, for example, nuclear nonproliferation, peacekeeping, food security, water scarcity and strengthening international norms and standards of state behavior. U.S.-Africa strategic cooperation is required to make steady progress on these cross-cutting issues, which serve broad American security interests. African states also help constitute the building blocks of the international state system; therefore, strengthening state sovereignty in Africa across the board would increase system reliability thereby benefiting the U.S. Unquestionably, the U.S. has a stake in enhancing the territorial integrity, a well-established symbol of state sovereignty, of African states. Additionally, the region possesses natural resources, such as oil and strategic minerals, important to the U.S. economy. With so much at stake, promulgating a deceptive or erroneous U.S. Africa policy would certainly undermine U.S. credibility anddiminish its global leadership position. With 54 countries, Africa wields considerable, even decisive, influence in international organizations. This is especially true within the UN system regarding global issues. The U.S. Congress has also been instrumental in shaping U.S. security policy. Specifically, U.S. policy credibility is strengthened by examinations by the Senate Committee on Foreign Relations and U.S. House Committee on Foreign Affairs, including the Africa sub-committees of both chambers. U.S. Congressional testimony at hearings, for example, on U.S. security cooperation in North Africa or support for peacekeeping in Somalia, leads to a better understanding of U.S. Africa policy by clarifying and putting policy into context. At the hearing on Somalia, for example, Linda Thomas-Greenfield, Assistant Secretary of State for African Affairs, described the AU mission in Somalia "as the primary stabilizing force in Somalia" and a prime example of the success of the "Africa-led model" for regional peacekeeping, which underscored the importance of continued U.S. support for African peacekeeping capability.24 Congress also convenes African, international security, and strategic experts for discussions in Washington to contemplate the causes, consequences and possible responses to instability in Africa as well as the policy implications. Strategic interaction sheds considerable light on U.S. policy toward Africa and the role of USAFRICOM in policy implementation, including refining its regional plans, strategies and operational capabilities. U.S. national security dialogue and scrutiny in this form also increase transparency and accountability of the U.S. government, thus increasing credibility. The U.S. National Security Strategy also identifies failed and failing states, particularly in Africa, as a threat to U.S. security because of their potential to become terrorist safe havens and sources of regional instability.26 Indeed, global terrorism has altered the basis of U.S.-Africa relations and added a new layer of complexity by the establishment of terrorist safe havens in fragile states that, if left unchecked, threaten American security, undermine regional security organizations and destabilize regions (and sub-regions) in Africa. Regional security also requires improving UN peacekeeping and humanitarian and disaster relief, particularly in Sub-Saharan Africa.29 On Sub-Saharan Africa strategy, Assistant Secretary of State for African Affairs, Linda Thomas-Greenfield, stated that USAFRICOM would "continue to develop military-to-military relationships with African countries" and build African security capacity," including expanded peacekeeping operations.30 The constitutive effects of such guidance on USAFRICOM is evident in its purpose, regional plans and strategies, command structures, regionallytailored forces and operating bases. United States Africa Command builds defense capabilities, responds to crisis, and deters and defeats transnational threats in order to advance U.S. national interests and promote regional security, stability, and prosperity. The USAFRICOM mission statement, purpose, and corresponding cornerstones follow coherently from U.S. security policy discourse on the increasing strategic importance of Africa. The correlation between strategic policy and USAFRICOM cornerstones enhances the credibility of U.S. policy toward Africa, especially the role of USAFRICOM in policy implementation. Such alignment also shows the constitutive effects of strategic policy and regional strategy on the shape of USAFRICOM for use as a mechanism in implementing policy. Integration at all levels of planning and implementation is essential to the development of sustainable regional crisis response and peacekeeping capability. USAFRICOM continues to play an advisory role for AU and regional organizations' peacekeeping operations. 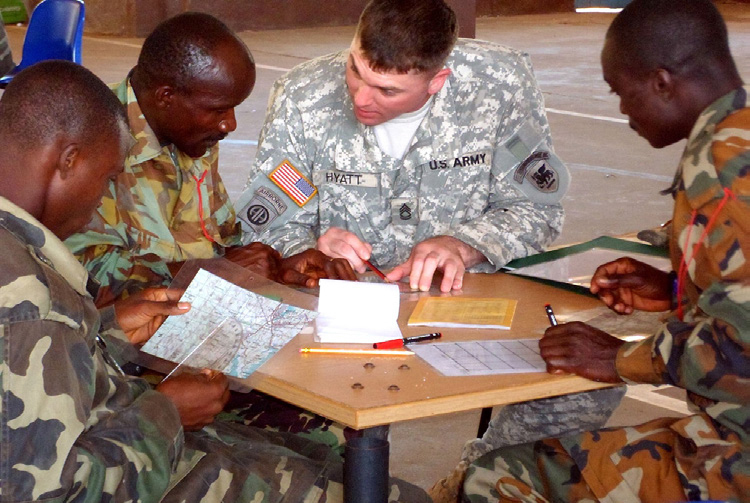 USAFRICOM, for example, has enabled improvements in the integration of African peacekeeping forces into regional organizations' command and control structures. A case in point is the assistance provided by the Combined Joint Task Force-Horn of Africa (CJTF-HOA), an operational headquarters of USAFRICOM, to the AU in establishing a Peace Support Operations Center at its headquarters in Ethiopia to communicate with deployed African peacekeeping forces, a core function of peacekeeping operations.42 This case further illustrates the importance of U.S. support for UN and regional organizations' peacekeeping as contained in U.S. policy toward Africa.43 CJTF-HOA security assistance also highlights the application of broad regional knowledge by USAFRICOM in response to regional security issues, including countryspecific and regional contexts. One option to address continued African skepticism regarding USAFRICOM would be to strengthen regional approaches to Africa's security, as well as the security capacity of the AU and regional organizations, including the "African Standby Force and its five region¬al brigades through battalion and brigade-level exercises, command post exercises, and U.S.supported peace training centers in each region. "47 The new African Peacekeeping Rapid Response Partnership may provide another useful mechanism for USAFRICOM to further incorporate contextualized approaches to regional peacekeeping. Additionally, USAFRICOM should consider working more closely with the UN Department of Peacekeeping Operations by leveraging the Pentagon and U.S. Department of State, including the U.S. Mission to the UN, in order to strengthen UN peacekeeping in Africa. USAFRICOM could also use these relationships to inform regional security policy, strategy and discourse on Africa both inside and outside of the UN system, particularly regarding international partners and policy institutes. While this option looks good on paper, the U.S. has been criticized by some for "AFRICOM's weak security concept, and the African continent's marked preference for collective security systems built around its regional organizations and the UN. "48 However, that does not necessarily mean that regional security structures or evolving regional security architecture would not be more useful in managing regional crises and complex security issues. Another option would be to move USAFRICOM headquarters from its current location in Stuttgart, Germany, to Washington, DC. Such a move would signify the increasing strategic importance of Africa to U.S. security, thus enhancing U.S. credibility in the region. This is particularly true since there is some resistance to positioning a USAFRICOM headquarters in Africa.49 It would also address regional security issues more effectively by leveraging expertise at the U.S. State Department, think tanks and other Washington-based intellectual resources, such as the United States Institute of Peace and the U.S. Department of Defense Africa Center for Strategic Studies. Consolidating these options and other policy initiatives into an allinclusive package would strengthen U.S Africa policy and strategy formulation and could be a useful template going forward. The U.S. has been able to pursue a policy of fostering regional security and stability in Africa, including support for African-led solutions to regional security issues, by using USAFRICOM as a mechanism for policy implementation. Unquestionably, the U.S. can help Africa solve its own regional security problems by continuing to develop a broad, long-term cooperative security relationship with Africa, including the use of USAFRICOM as a regional framework for U.S. security cooperation with African states and regional organizations. The U.S. certainly has a stake in preserving and strengthening the international state system, including Africa, especially given its global leadership position. Such strategic cooperation should also dispel the myth regarding the possible militarization of U.S. policy toward Africa. U.S. policy toward Africa can be seen in U.S. policy documents, such as the U.S. National Security Strategy, Quadrennial Defense Review, U.S. Strategy toward SubSaharan Africa, and other strategic guidance. The role of USAFRICOM in regional security issues in Africa can also be readily derived from such documents. U.S. policy toward Africa crafted in Washington has been instrumental in shaping USAFRICOM, including its purpose, regional plans and strategies, command structures, regionally-tailored forces and forward operating locations. Clearly, USAFRICOM has played a stabilizing role in the region, and changed perceptions to some degree by articulating its purpose to regional stakeholders, soliciting feedback, and aligning itself with U.S. Africa policy and objectives. Undoubtedly, USAFRICOM has helped build the security capacity of African states and regional organizations, especially for regional peacekeeping, and humanitarian and disaster relief. The continued success of U.S. policy toward Africa will depend on its applicability and credibility, including the appropriate use of USAFRICOM for policy implementation. It will also depend on USAFRICOM's ability to help shape U.S. policy toward Africa based on its cumulative experience in the region – and refining the rough edges of a regional strategy within which any U.S. regional command will inevitably be viewed. Frazer, J. (2008, February). AFRICOM: The American Military and Public Diplomacy. Speech presented at the Annenberg School of Communication, Program on Public Diplomacy, University of Southern California, Los Angeles, CA. The Fund for Peace. (2014). Fragile States Index 2014. Retrieved from http://ffp.statesindex.org/. United States Institute of Peace. (2001). Special Report on Peacekeeping in Africa. Retrieved from http://www.usip.org/publications/peacekeeping-in-africa. Warner, Lesley Anne. (2008). Top Five Reasons Why Africa Should be a Priority for the United States. Brookings Africa Growth Initiative. The Brookings Institution. Retrieved from http://www.brookings.edu/research/reports/2013/04/africa-priority-united-states. UN. (2014). MINUSMA Facts and Figures. Retrieved from http://www.un.org/en/peacekeeping/missions/minusma/facts. The White House Office of the Press Secretary. (2014). President Obama at Conclusion of the U.S.-Africa Leaders Summit. Retrieved from http://iipdigital.usembassy.gov/st/english/texttrans/2014/08/20140806305230.html#axzz3EAaNFbIC. The White House Office of the Press Secretary. (2014). Fact Sheet: U.S. Support for Peacekeeping in Africa. Retrieved from http://www.whitehouse.gov/the-press-office/2014/08/06/fact-sheet-us-support-peacekeeping-africa. Robinson, D. Obama Outlines Partnership Model with Africa. (June 30, 2013). Voice of America. Retrieved from http://www.voanews.com/content/obama-outlines-partnership-model-with-africa/1692362.html. The White House Office of the Press Secretary. (2009). Remarks by the President to the Ghanaian Parliament. Retrieved from http://www.whitehouse.gov/the-press-office/remarks-president-ghanaian-parliament. PBS News Hour. (2013) Assessing the Substance and Symbolism of Obama’s Africa Trip and Outreach. Transcript retrieved from http://www.pbs.org/newshour/bb/africa/july-dec13/africa2_07-02.html. Mesfin, Berouk. (2009). The establishment and implications of the Unites States Africa Command: An African Perspective. Retrieved from http://www.issafrica.org/publications/papers/the-establishment-and-implications-of-the-united-states-africa-command-an-african-perspective. The White House Office of the Press Secretary. (2014). Remarks by National Security Advisor Susan E. Rice “Africa and America: Partners in a Shared Future.” Retrieved from http://www.whitehouse.gov/the-press-office/2014/07/30/remarks-national-security-advisor-susan-e-rice-africa-and-america-partne. Jervis, Robert (1970). The Logic of Images in International Relations. Princeton: Princeton University Press. The White House. (2010). National Security Strategy. Retrieved from http://www.whitehouse.gov/sites/default/files/rss_viewer/national_security_strategy.pdf. U.S. Department of Defense. (2010). Quadrennial Defense Review Report. Retrieved from http://www.defense.gov/qdr/images/QDR_as_of_12Feb10_1000.pdf. The White House. (2012). U.S. Strategy toward Sub-Saharan Africa. Retrieved from http://www.whitehouse.gov/sites/default/files/docs/africa_strategy_2.pdf. U.S. AFRICOM Public Affairs. (2012). 2012 Posture Statement: Statement of General Carter Ham to the Senate Armed Services Committee. Retrieved from http://www.africom.mil/newsroom/article/8832/2012-posture-statement-statement-of-general-carter. U.S. Africa Command. (2014). Retrieved from http://www.africom.mil/about-the-command. U.S. Africa Command Public Affairs. (2008). Senior Pentagon, State Department Officials Discuss Militarization of Foreign Policy at Congressional Hearing. Retrieved from http://www.africom.mil/Newsroom/article/6274/senior-pentagon-state-department-officials-discuss. U.S. Africa Command. (2014). Retrieved from http://www.africom.mil/about-the-command/cornerstones. U.S. Department of State. (2014). Fact Sheet: Africa Contingency Operations Training and Assistance (ACOTA) Program. Retrieved from http://www.state.gov/r/pa/prs/ps/2013/02/203841.htm. CJTF-HOA Public Affairs. (2011). African Union Stands Up Peace Support Operations Center. Retrieved from http://www.africom.mil/Newsroom/Article/8479/african-union-stands-up-peace-support-operations-c.
Volman, D. (June 2008). AFRICOM: The New Military Command for Africa. African Security Research Project. Association of Concerned Africa Scholars. Retrieved from http://concernedafricascholars.org/african-security-research-project/?p=12. U.S. Department of Defense. (2012). Sustaining U.S. Global Leadership: Priorities for 21st Century Defense. Retrieved from http://www.defense.gov/news/defense_strategic_guidance.pdf. Mboup, M. D. (2008), The African Perception of the United States’ Post- 9/11 Africa Policy and AFRICOM (Master’s Thesis). U.S. Army Command and General Staff College. 2008. Retrieved from http://govwin.com/knowledge/africans-perception-united-states-post911/27401. U.S. AFRICOM Public Affairs. (2013), AFRICOM Leaders Discuss Command’s Mission with Nigerian Journalists. Retrieved from http://www.africom.mil/Newsroom/transcript/10306/africom-leaders-discuss-commands-mission. “AFRICOM Seal” by Unknown Author. Work of U.S. Federal Government, permission in public domain via Wikimedia Commons. “President Obama Participates in the U.S.-Africa Leaders Summit Family Photo” by U.S. Department of State by PD-USGov under Flikir. Work of employee or official in U.S. Federal Government, permission in public domain via Wikimedia Commons. “U.S. Army Africa ‘Train the Trainers’ in Ghana 09” by US Army Africa from Vicenza, Italy. Licensed under the Creative Commons Attribution 2.0 Generic via Wikimedia Commons. “ACOTA Training in Sierra Leone - Flickr - US Army Africa” by US Army Africa from Vicenza, Italy. Licensed under the Creative Commons Attribution 2.0 Generic via Wikimedia Commons.